Lobby Call is an invitation to show up. Showing up is vital, especially in November. Join us, in collaboration with Southern Cultures Quarterly and The Nasher Museum, for a therapeutic gathering to soothe pre-election nerves with communal creativity. Sing historic protest songs with your neighbor in a cathartic choir, make your own freak flag to fly at the make-and-take station with RivTak Handmade, and build a collective floral sculpture with the Fireside Farm flower truck. 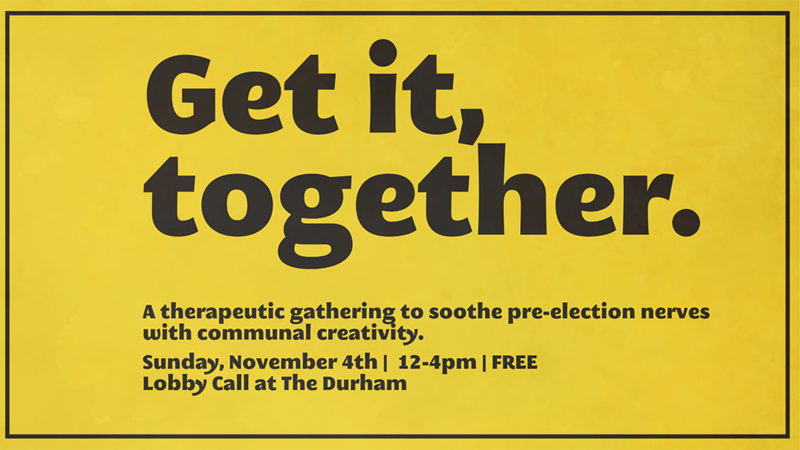 Plus, engage with representatives from the City of Durham’s Participatory Budgeting Initiative to work towards a stronger community so that we can get it, together.